ST. GEORGE, Utah -- Republican presidential candidate and Ohio Gov. John Kasich walked back from comments he made during an interview on "Meet The Press," saying that that if he becomes president, he would not consider Merrick Garland, President Obama's Supreme Court nominee, as a potential replacement for the late Justice Antonin Scalia. In a pre-taped interview on Saturday, NBC's Chuck Todd asked Kasich about whether the Senate should hold hearings on Obama's pick. Kasich noted that while he doesn't think Obama should have named a replacement in the first place, he stated that members of the Senate should show Garland "respect" by granting him a meeting, and that he could possibly consider putting him under consideration as his own nominee. "I think they can go ahead and have a meeting with him," Kasich said. "The senators can meet with this gentleman. And then maybe ultimately, if I'm president -- which I think we have a good shot at being — maybe he'll be under consideration for the Supreme Court. I don't know. But they ought to meet with him. Show him that amount of respect." "In an effort to be polite today, I've created little bit of a situation," Kasich said after a campaign event in St. George. "Look, you know, Garland is -- I'm gonna have my own picks for the Supreme Court. You know, the fact is, I said that they ought to meet him and talk to him and, you know, I'm not gonna pick somebody who's, you know, obviously not a respecter of the Second Amendment. I don't want people making law and so, nobody should be confused, worked up or upset. He's not gonna be my pick for the Supreme Court." Kasich noted that his "gut reaction" was that people like Sen. Orrin Hatch, R-Utah, had spoken favorably of Garland in the past. "He got a lot of votes. But you know, I'm just trying to be polite sometimes, you know? There's nothing wrong with that. ... Everybody just take a chill pill." 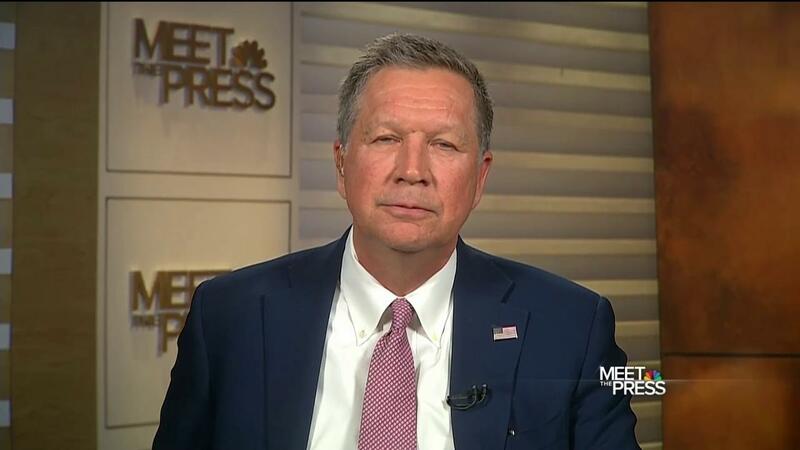 During his interview on Meet The Press, Kasich also defended his strategy of staying in the race and attempting to amass delegates for an ultimate fight for the nomination at the Republican National Convention in Cleveland this summer. "Let me also tell you, no one is going to that convention with enough delegates. I will have more delegates moving in there that will give me momentum," Kasich said. When pressed about what could happen when he and the other non-Trump candidate, Texas Sen. Ted Cruz, split the vote in states like Utah, Kasich responded, "maybe Ted ought to get out because he can't win in the fall. And maybe these people that are hot on that ought to tell him to do it." Kasich also again flatly denied that there's any chance he would consider a spot as a running mate with either of his Republican competitors. He said "under no circumstances," would he serve as Trump's vice president. "Are you people kidding me?" and that there's "absolutely" no chance he would run under Cruz, either.